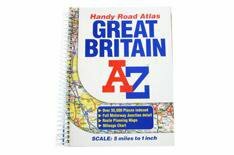 11th A-Z Handy Road Atlas GB 6.95 | What Car? There's no questioning the quality of the mapping, but even at the 1:308,000 scale, there's just too much information on each page of this A5-sized atlas. The writing is tiny, and if you need to travel on anything other than major roads, you'll need good eyesight and good concentration. This atlas is spiral bound, and the gap between the left- and right-hand pages is large. The irritation this causes is offset by the use of shaded mapping in the gutter, but it still takes time to read between the two sides. Many pages are crowded with place names, and numerous tourist destinations add to the clutter. You get a 256-page atlas, which is a lot for your money. Throw in a moderate internet discount, and you're looking at a something that represents good value. The spiral binder and wipe-clean covers are the highlights here. The paper is thin, but not so much that it'll rip easily if you turn pages quickly. The map's key and tourist information explanations are in English, French and German. Overall route-planning maps are included, as is a Channel Tunnel map, larger-scale maps of the Scottish islands and a mileage chart.